Welcome back and thank you so much for stopping by! Today I have another Sweet Peony Card to share with you. I have to tell you that I absolutely love this collection. I know I say that all the time but I really mean it!!! This beautiful peony reminds me that life is just so amazing. keep each other safe is just beautiful. much I appreciate and wrap my heart around all of you. As a five year cancer survivor, I think of today as my special birthday. 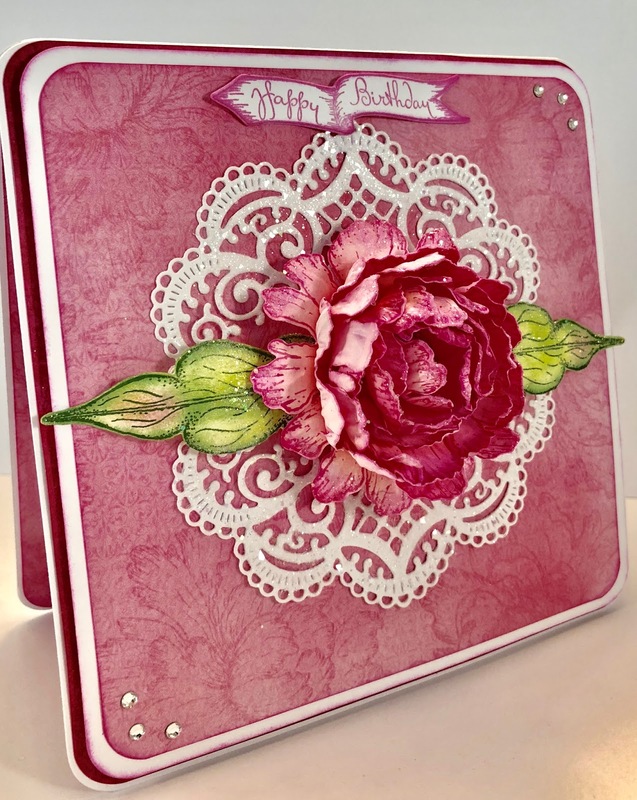 Other Products: Floral Oriental Cardstock, Dimensional Tape, Sponge, Hot Glue Gun, Misti, Big Shot Plus, Scissor, Corner Rounder, Swarovski Crystals. Create a 6” x6” tent fold card base by cutting white cardstock 12” x 6”, score and fold at 6” on the long side. Round all of the corners. 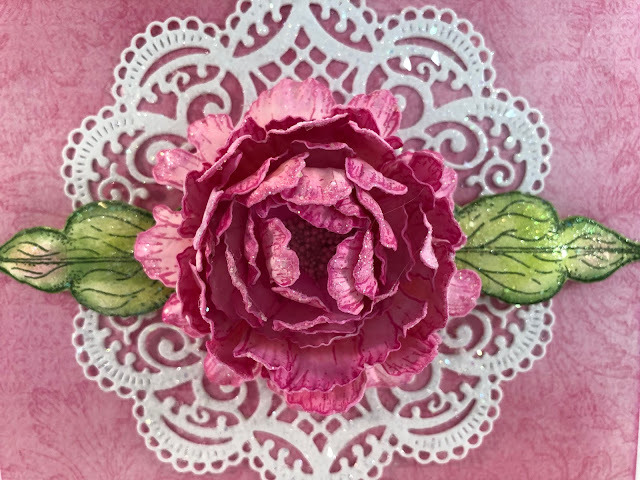 Cut the dark pink paper from the collection 5 5/8” x 5 5/8” Round the corners, ink the edges with Magenta Hue ink and adhere to the card base with dries clear adhesive. Cut a white mat layer 5 3/4” x 5 3/4” and cut a light pink layer from the collection 5 1/2” x 5 1/2”. Round the corners, ink the edges of both with Magenta Hue, adhere together with dries clear adhesive and then adhere to the card base with dimensional tape. Cut another piece of the lighter pink paper 5 7/8” x 5 7/8”, round the corners, ink the edges and adhere to the inside of the card. Die cut two of the Festive Holiday dies from white cardstock, sponge with dries clear adhesive and sprinkle with Rajni Chawla’s Crystal Clear. Adhere to the center of the card base. 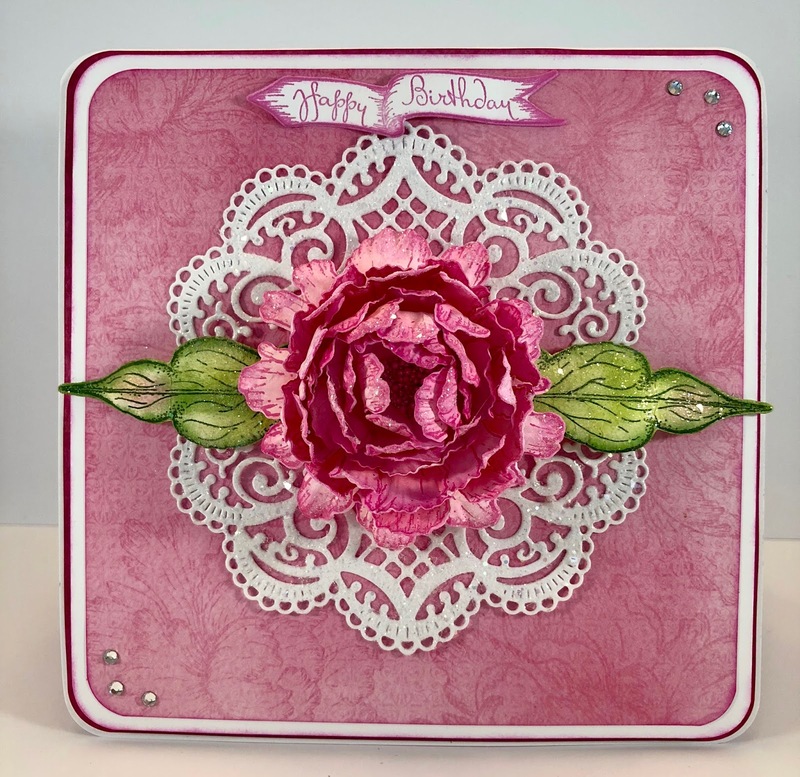 Stamp the Happy Birthday from the Simply Classic Stamp set on white cardstock with Magenta Hue ink and cut with the coordinating die. Shape lightly and adhere to the top of the card front. Stamp the Large Peonies three times on Floral Oriental White cardstock with Magenta Hue ink. Color with Rose Madder and Magenta Hue ink, diecut using the coordinating dies, shape using the 3D Floral Basics Shaping Tool and finish the shaping with the Deluxe Flower Shaping Kit. Assemble the petals to create one large flower. Add Minnie Pearls Prills to the flower center, sponge with dries clear adhesive and sprinkle with Rajni Chawla’s Crystal Clear. Stamp the large leaf twice on white cardstock with Ranger Archival Olive ink, color with Leaf Green and Magenta Hue inks. Shape using the Deluxe Flower shaping kit, sponge with dries clear adhesive and sprinkle with Crystal Clear. Adhere the flower and the leaves to the center of Festive Holiday die as shown using a hot glue gun. Adhere three Swarovski Crystals each to the top right corner and the bottom left corner. created by the best design team. You'll be blown away. Thanks again for stopping by and have a beautiful day! I love your project! First off your flower is so gorgeous and of course I love all the glitter. You created a beautiful plate for the flower to rest on and I love all the layers as well. Just a very pretty card indeed! Thank you so much Glenda! I so appreciate you comments as you are the queen of perfection! What a beautiful card!! Your peony is just gorgeous! 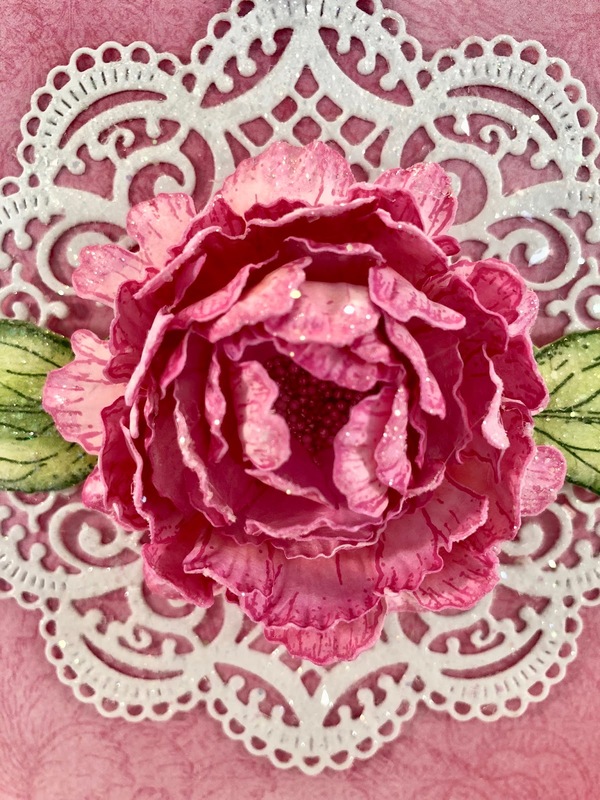 Wow, this is such a gorgeous card with that beautiful big peony!! Love it! Thank you so much Robin...you made my day!